Life doesn't always go as planned—sometimes that’s good, and sometimes that’s painful. Sometimes we need God to unravel us, for we long to be changed. This worship series explores 12 stories of unraveled shame, identity, fear, grief, dreams, and expectations. These are stories where God meets us in the spiraling, unraveling our plans—and us—into something new. We plan to release this bundle in mid-May. If you're able to work on that timeline, this would make a great series for the summer. But we've also created it with the fall in mind, especially since many of these stories may require pastoral presence and would be best explored after the incongruity of summer travels. The good news is, this bundle could be used at any time throughout the year. We hope you will customize it, arranging the stories into the order and duration that works best for your context. Download our Free Theme Infographic below to learn all about the theme, what stories are included, what resources we're planning to release, and to glean some worship & programmatic inspiration to get you started on your planning. Save this PDF to your desktop or print it out on 11x17 paper and share it with your staff and/or worship planning teams. 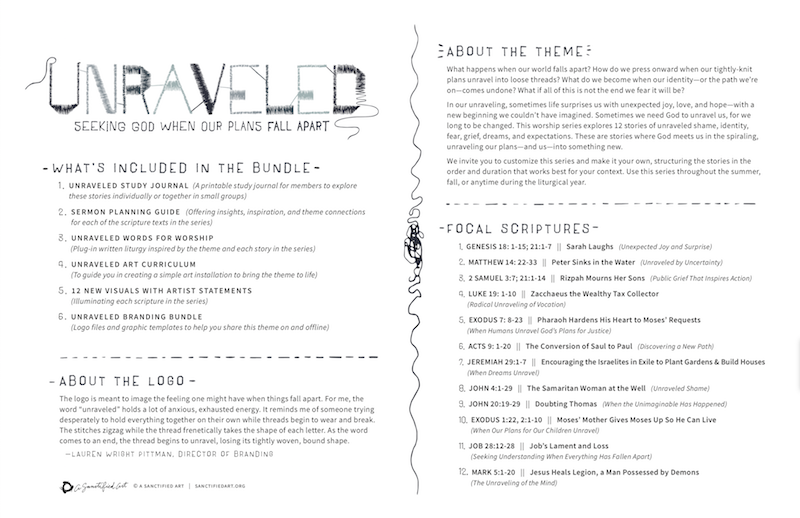 Download our Free Unraveled Theme Infographic! Thanks for joining us! Check your inbox to confirm. Click below to download our theme infographic and get to planning!